Hello everyone! Today is the start of a new month with Sin City Stamps, and August proves to be yet another fun partnership with our good friends over at Altered Pages. The designers on both teams will be using the theme "Fairies" for the first half of the month. So be sure to stop by both blogs to see all the inspiration from everyone. 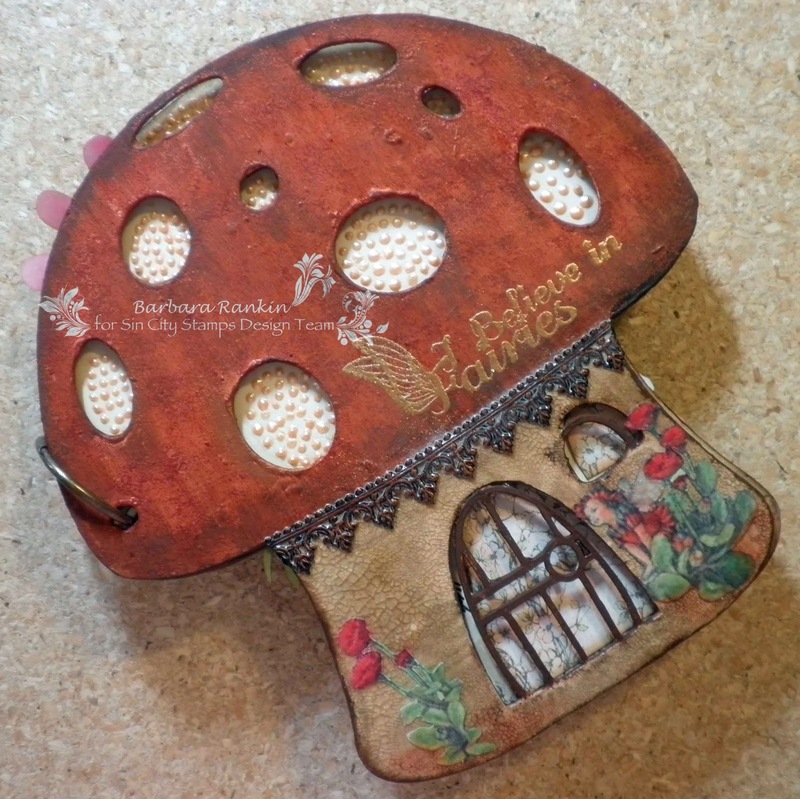 In keeping with the fairies theme, and because I received this awesome little Mushroom Chipboard Book from Sin City Stamps and lots of fairy collage images from Altered Pages, I made this adorable little mini book. I prepared this video preview showcasing each page and a brief description of how I put it together. For a complete video tutorial on how I made this book, please visit my youtube channel by clicking this link. Thanks for stopping by, and be sure to visit Sin City Stamps and Altered Pages for more shopping and inspiration! This is totally adorable! I love the German scrap here. It really highlights the bottom of the mushroom. What a gorgeous little book.. love everything about it... the crackle looks great...and the fussy cutting the angels is great.. AWESOME!!!!!! So many lite details! Love the video tour!!! I Love how your project turned out. I didn't know Sin City made die cut's too. thanks for sharing your awesome project. As always awesome job Barbara! Love it!! !